The 3rd Annual Plein Air Golf Event, on Sunday, June 4 at the Choptank River Golf and Events Center in Cambridge, is presented by the Dorchester Center for the Arts and PNC Wealth Management. For more information, call 410-228-7782 or visit dorchesterarts.org. Admission to the dinner and auction on Sunday evening is $50 per person. Proceeds from the Plein Air Golf event benefit the DCA Summer Arts children’s program and improvements to the performance venue. In other news, the Dorchester Center for the Arts is pleased to announce a new outreach initiative, “Art in the Park,” in Friendship Park in East New Market. This series of family-friendly art activities will continue on Second Saturdays June 10 and July 8. From 10 a.m. to noon, the public is invited to stop by and enjoy a free art project, all materials provided. These events will be held rain or shine as there is plenty of cover in the pavilion area. Children under 12 should be accompanied by an adult. This program is partially funded by the Maryland State Arts Council. Additional offsite art activities are being planned for other areas throughout Dorchester County. 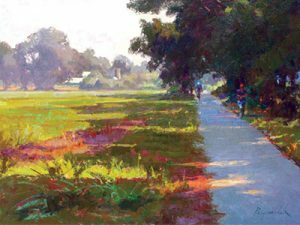 Registration is now open for a four-day landscape painting workshop with award-winning California Plein Air colorist Camille Przewodek, to be held July 24 through 27. Space is limited; early registration advised. 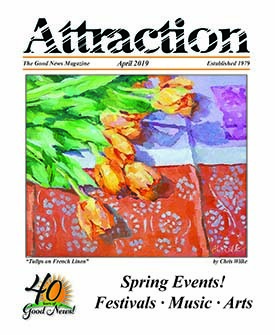 Camille is a Signature Member of Laguna Plein Air Painters, Oil Painters of America, American Impressionist Society and Master Signature Member American Women Artists. She holds a BFA in Illustration from Academy of Art College, San Francisco and a BFA in Painting from Wayne State University, Detroit. Camille will be doing demos throughout the workshop. Students will do a color study before lunch, followed by one or two color studies in the afternoon. Students are encouraged to bring either original artwork or photos and to talk with Camille about their vision as an artist. For more information and registration, contact DCA at 410-228-7782 or visit dorchesterarts.org.